Brian Ruffell joined Dr. Johnson’s lab as a graduate student in 2002, on a project to investigate the function of chondroitin sulfate addition to CD44. Brian’s work examined the function of this post-translational modification in macrophages and T cells where he discovered a major role for chondroitin sulfate in regulating hyaluronan binding by CD44. Dr. Ruffell is currently at the University of California, San Francisco, pursuing his research interests in the role of inflammation in cancer progression and metastasis. Dr. Johnson became interested in the function of cell surface molecules during her PhD. in Biochemistry at the University of Dundee, under the tutelage of Dr. Peter Garland and Dr. Roger Clegg. In her post-doc, she entered the field of Immunology in Dr. Alan William’s lab at the University of Oxford in 1983, where she characterized and cloned the lymphocyte cell surface antigen, CD8. In 1987 she went to the Salk Institute to investigate the function of the leukocyte specific antigen, CD45, in Dr. Ian Trowbridge’s lab. It was here where she was inspired by the work of Dr. Jayne Lesley and Dr. Bob Hyman who worked in the adjacent lab, and soon became fascinated by the cell adhesion molecule, CD44. She began her own lab at the University of British Columbia (UBC) in Vancouver in 1991, initially working on the molecular function of CD44 and CD45 in T lymphocytes. Dr. Johnson is now professor and co-director of the Infection, Inflammation and Immunity (I3) research group at UBC and present research interests include: the regulation of innate and adaptive immune responses by CD45; how CD44 interactions with hyaluronan regulate the immune response; the regulation of leukocyte adhesion and migration by CD44; and how CD44 contributes to the inflammation process. The extracellular matrix glycosaminoglycan, hyaluronan (HA), is an unbranched polymer composed of repeating glucuronic acid and N-acetyl glucosamine disaccharide units. Unlike other glycosaminoglycans that are made as proteoglycans, HA is not linked to a protein core and is instead synthesized by up to three hyaluronan synthases that reside on the inner surface of the plasma membrane. Transportation of HA to the cell surface during synthesis allows up to 25,000 disaccharides to be linked together, creating a polysaccharide with a molecular mass that normally ranges between 106-107 Daltons. HA is a critical component of the extracellular matrix (ECM), demonstrated by the embryonic lethality of hyaluronan synthase-2 knockout mice 1. HA is bound by a number of ECM and cell surface proteins. These HA-binding proteins are termed hyaladherins and share a homologous HA binding domain with the Link protein, which is referred to as the Link homology domain 2. Examples include aggrecan, versican, and tumor necrosis factor alpha stimulated gene 6 (TSG-6, 3). Although there is an endocytic receptor for HA (HARE) present in the liver, spleen, and lymph nodes 4, it does not possess a Link homology domain. The Link homology domain is also absent from SHAP (inter alpha trypsin inhibitor heavy chain), a serum protein that can bind covalently to HA 5. Two transmembrane hyaladherins have been described, and one of these, lymphatic vessel endothelial receptor-1 (LYVE-1) is predominantly expressed by lymphatic endothelium 6. The other, more widely expressed molecule, CD44, has been implicated in a range of processes that are largely, but not exclusively, dependent on its function as an HA-binding protein 7. CD44, the primary cell surface receptor for HA, is present at varying levels on the majority of cells in the immune system 8. These cells predominantly express the standard (CD44s) or hematopoietic (CD44H) form of CD44. Additional isoforms of CD44 can be expressed by alternative splicing of 10 variably expressed exons, but these are generally a minor component of the total CD44 expressed in leukocytes and will not be further discussed here. Even in the absence of these additional isoforms, there is a high degree of heterogeneity in the structure of CD44 due to extensive post-translational modifications. CD44 can be modified by N- and O-linked glycosylation 9 and glycosaminoglycan addition 9-11, and their addition and composition is dynamically regulated by the cell 12-15. The carbohydrate moieties of CD44 can function independently as blood group antigens on red blood cells 16 and as ligands for E-selectin on neutrophils 17 and E- and L-selectin on human hematopoietic progenitor cells 18,19. CD44 has an amino terminal Link module homology domain that is responsible for binding HA. Crystallization of the amino terminal region of CD44 with HA shows HA binding to a shallow groove in the Link homology domain in an interaction that is dominated by hydrogen bonds and van der Waals forces 20. Notably, CD44 was crystallized in two conformational states: one with HA bound and one without. In addition, the conformation of the HA oligosaccharide was slightly different when it bound to CD44. In the HA binding conformation of CD44, a number of residues showed a slight shift, including a critical arginine residue that moved to form a closer interaction with HA 20. This raises the interesting possibility that CD44 may exist in two conformational states in cells (a high and low affinity state), which may help explain the different HA binding states of CD44 observed in lymphoid cells 21. However at this point, it is not known whether different conformational states of CD44 exist in cells and if so, whether HA itself or other factors such as the post-translational modifications of CD44 induce or help stabilize a particular conformation of CD44. The CD44-HA interaction can lead to a transient, rolling interaction under flow conditions or a more stable cell-cell or cell-matrix interaction under static conditions. The extent of HA binding by leukocytes is determined by the complex interplay of multivalent interactions between CD44 and HA that is dependent upon the amount and density of CD44 at the cell surface, as well as its activation state, which is determined by cell specific factors 22. These are discussed in more detail in the next section. CD44 can exist in three different states in lymphoid cells with respect to HA binding: non-binding, inducible (by the CD44 IRAW14 mAb) and constitutive 23. These states may arise due to differential glycosylation or glycosaminoglycan addition to CD44 12. Expression levels of CD44 can further enhance HA binding once a distinct threshold level has been obtained. In addition to post-translational modifications of CD44, the presentation of HA can affect how these two molecules interact. N and O-linked carbohydrates, as well as glycosaminoglycan addition to CD44 can influence its ability to bind HA 12 and reviewed in 24-26. These modifications can have both positive and negative effects, depending on the type of glycosylation involved and the cell type examined (see Table 1). While all of the five N-glycosylation sites on CD44 reside in the amino terminal Link homology domain, the majority of O-linked glycosylation is thought to occur in the membrane proximal stem-like region of CD44 26, where the site of chondroitin sulfate addition occurs 27,28. Generally, HA binding increases with reduced N-glycosylation, although this is cell type dependent. For example, mutation of N1 and N5 glycosylation sites led to constitutive binding in inducible cell lines, yet carbohydrate addition at these sites did not prevent constitutive HA binding in other cells 12,13,29. This implies that other regulatory mechanisms can overcome the negative regulatory effect of N-glycosylation. At least part of the negative effect of N-linked glycans on CD44 may be due to the presence of terminal sialic acid residues, as their removal enhances HA binding 13,30. Some N-glycosylation sites are close to the HA binding groove, raising the possibility that glycosylation at these sites could directly prevent HA binding by steric hindrance or charge repulsion, or could interact with residues on CD44 close to the HA binding groove and reduce the affinity of CD44 for HA. Alternatively, carbohydrates located away from the binding groove may affect HA binding indirectly, by interacting with CD44 residues and stabilizing an unfavorable HA binding conformation of CD44. Chondroitin sulfate addition to CD44 can also negatively affect HA binding 28. Addition of chondroitin sulfate occurs at serine 180 in human CD44 28, which is located outside the HA binding domain of CD44. It may negatively regulate HA binding either indirectly by affecting CD44 conformation, or directly by competing for HA binding, as chondroitin sulfate modified proteins can bind to the HA binding site of CD44 31,32. Providing that CD44 is capable of binding HA and that a threshold level of CD44 has been obtained, HA binding increases with increasing CD44 expression 29. HA binding can be augmented by the association of the cytoplasmic domain of CD44 with the actin cytoskeleton 21,33, as disruption of actin polymerization in monocytes 34 and stimulated T cells 35 reduces HA binding. The association of CD44 with the cytoskeleton can occur via an interaction with phosphorylated ERM proteins 36 and this may influence HA binding, at least in some cell types 34. CD44 and phosphorylated ERM proteins co-localize in TNFα-activated monocytes and prevention of ERM phosphorylation by a kinase inhibitor reduces HA binding. An interaction of CD44 with the cytoskeleton may facilitate clustering and enhance the avidity of CD44 for HA, or it may induce a conformational change in CD44 that increases its affinity for HA. In some cell lines, the CD44 IRAW14 mAb, but not its Fab fragment, can induce HA binding 37, suggesting that dimerization or an antibody induced conformational change facilitates HA binding. Fig. 1 illustrates the different mechanisms that may regulate CD44 binding to HA. They may occur alone or in combination, and depend on the activation state of the cell and the cell type. The challenge now is to identify which mechanisms are evoked under physiological conditions. 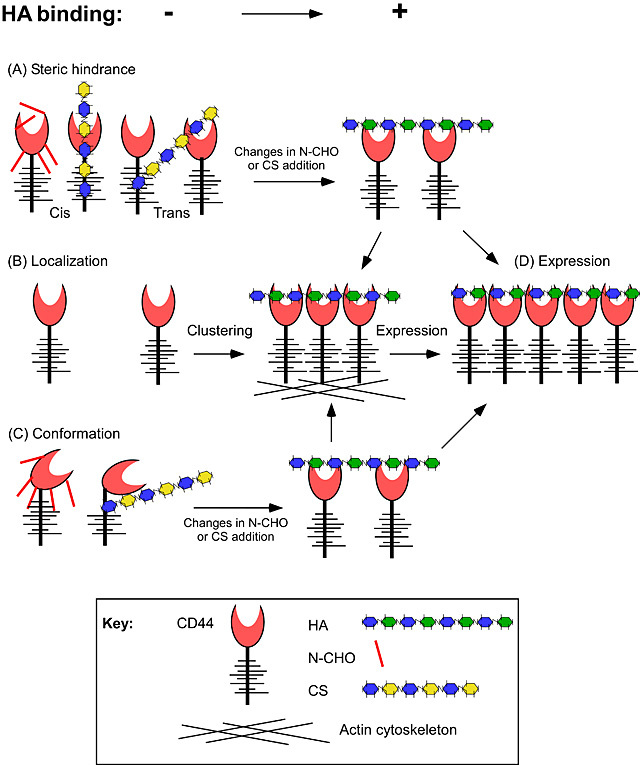 Potential mechanisms to regulate HA binding by CD44. (A) Steric hindrance by post-translational modifications such as N-glycosylation (N-CHO) or chondroitin sulfate (CS) addition to CD44 may prevent HA binding or reduce the affinity of CD44 for HA. (B) Local increases in CD44 expression caused by clustering may enhance the avidity of the interaction. (C) Post-translational modifications, such as N-CHO or CS may cause conformational changes that have different binding affinities for HA. (D) Increases in CD44 expression can increase HA binding by increasing the avidity of the interaction, provided that an initial threshold level has been met and that negative regulators of HA binding are not preventing the interaction. Sialic acid residues negatively regulate HA binding in human peripheral blood monocytes (PBM) 38. This was demonstrated during LPS-induced HA binding, as sialidase activity was increased and inclusion of a sialidase inhibitor reduced HA binding 38. TNFα also induces HA binding in human monocytic cells 14,39 and although this correlates with increased carbohydrate sulfation of CD44 15, it has not been proven that this is directly responsible for the induction of HA binding. Likewise, it has not been proven that changes in N-glycosylation contribute to TNFα induced HA binding. However, there is accumulating evidence supporting a physiological role for chondroitin sulfate addition in regulating HA binding. TNFα reduces chondroitin sulfate addition to CD44 and induces HA binding in mouse bone marrow-derived macrophages (unpublished data) and inhibition of glycosaminoglycan addition in both mouse bone marrow-derived macrophages and human monocytic cells 40, or specific prevention of chondroitin sulfate addition by mutation of CD44 in human Jurkat T cells 41 induces HA binding. Therefore, sialic acid and chondroitin sulfate are two physiological regulators of HA binding in monocytes/macrophages. The physiological regulators in other leukocytes remain to be established. Inflammatory stimuli upregulate HA expression on endothelial cells 42 providing one mechanism to facilitate a CD44-dependent leukocyte interaction at inflammatory sites. Inflammatory conditions also upregulate TSG-6 3, which can bind to HA and enhance the interaction of HA with CD44, possibly by crosslinking HA and increasing the avidity of the interaction 43. SHAP, a protein present in serum, can covalently bind to HA and enhance its binding to CD44 44. This may have physiological consequences, as U937 monocytic cells and peripheral blood mononuclear cells, which do not normally bind significant levels of soluble fluoresceinated HA (Fl-HA), can bind to SHAP-associated HA cables produced by poly I:C stimulation of smooth muscle cells 45,46. In addition, an increase in the expression of SHAP upon LPS-induced hepatic injury was speculated to account for the CD44:HA dependent sequestration of neutrophils in liver sinusoids, as levels of HA did not change and CD44 on neutrophils was not upregulated to bind HA 47. These studies imply that HA binding proteins can influence how HA is presented to CD44, which in turn, may affect the affinity or avidity of the interaction. Together, these data indicate that the CD44:HA interaction can be regulated by modifications to both CD44 and HA. CD44 is expressed on early hematopoietic progenitor cells (including the hematopoietic stem cell) and has been implicated in the homing of hematopoietic stem cells after bone marrow transplantation 48,49. Despite this and evidence that HA is a component of the stem cell niche in the bone marrow 50, CD44 null mice appear to develop normally 51,52. CD44 is expressed on early thymocyte progenitors in the thymus and is down regulated during thymocyte development. Initial blocking studies with CD44 mAbs suggested a role for CD44 in thymic progenitor homing 53, but this was not apparent in the CD44 null mice 51, leaving the functional significance of CD44 on these early T cell progenitors unknown. CD44 is expressed at low levels on naïve T cells exiting the thymus in C57Bl/6 mice, although expression levels vary with the strain of mouse (reviewed in 8). Again, initial studies in the human suggesting a role for CD44 in lymphocyte homing 54 were not substantiated in the CD44 null mouse 51 and competition experiments between wild type and CD44-deficient lymphocytes show similar trafficking patterns in naïve recipients 55. Thus, CD44 appears to be dispensable for normal immune cell development and homeostasis in the mouse, although it is possible that the lack of CD44 may be compensated for in the CD44 null mouse by other adhesion molecules or by RHAMM, as has been suggested 56. Although CD44 is expressed on most cells of the immune system to varying degrees, the majority of cells do not bind detectable levels of Fl-HA under normal homeostatic conditions. CD44 levels are increased in monocytes upon exposure to inflammatory agents 39 and in T cells upon antigen-induced activation in C57Bl/6 mice, making high levels of CD44 a marker for activated and memory T cells 57. As immune cells have to be activated to bind Fl-HA, perhaps it is not surprising that the functional consequences of HA binding were not revealed until an immune response was initiated. 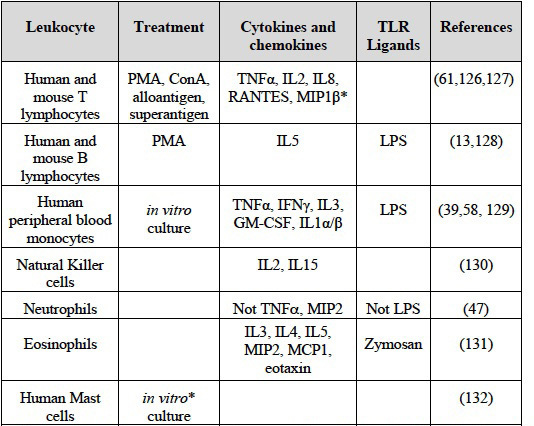 Factors that induce HA binding in primary, ex vivo leukocytes are summarized in Table 2. Data is restricted to primary ex vivo immune cells and doesn't include data from cell lines. HA binding is measured using soluble Fl-HA and flow cytometry. Dendritic cells express HA on their surface as detected by Pep-172. Stimulation of human peripheral blood monocytes with LPS, IFN , IL-1, TNFα, and GM-CSF all upregulate CD44 expression and induce HA binding 39,58, although TNFα produced in response to IL-1 and GM-CSF was responsible for the induction of HA binding in these cases. IL-4 and IL-13 inhibited TNFα-induced HA binding, and inhibition of N-glycosylation and chondroitin sulfate addition both prevented the IL-4 induced downregulation of HA binding 40. Although IL-10 is considered an anti-inflammatory cytokine, it also induced HA binding in human monocytes 40. Neutrophils do not bind detectable levels of soluble Fl-HA following exposure to inflammatory stimuli and do not exhibit HA dependent rolling in vitro 59, yet the absence of CD44 or HA reduced neutrophil adherence and emigration in a chemokine-induced model of leukocyte recruitment 59. Neutrophil adhesion was also reduced at liver sinusoids in the CD44 null mouse upon LPS-induced hepatic injury 47. This apparent discrepancy may be explained if HA binding is too low to be detected by soluble Fl-HA or if HA binding in vivo is different from binding soluble Fl-HA in vitro. In support of the former, effector Th1 and Th2 cells that have very little detectable Fl-HA binding can roll in an HA-dependent manner 60. In support of the latter, two studies have shown that CD44 expressing cells bind more HA when other HA binding proteins, such as SHAP and TSG-6, are present 43,44. An increase in CD44 expression and a transient induction in HA binding were observed in a percentage of both CD4+ and CD8+ T cell populations in vivo upon activation of an immune response 61,62. However, is not clear why HA binding is only induced in a percentage of activated T cells or why the binding is transient. Although all the CD8+ effector cytotoxic T cells were present in the HA binding population, neither blocking by HA or CD44 mAbs prevented cytolysis 61. However, other studies with human cytotoxic T cells, NK cells and NKT cells showed that CD44 crosslinking can enhance their effector function 63-65, and data from CD44 and LFA-1 double null mice show reduced conjugate formation in IL2-activated NK cells 66. HA binding also marks the most functionally active T regulatory cells 67 and high molecular mass HA can enhance the suppressive ability of these cells 68. Antibody cross-linking of CD44 provides co-stimulatory activity during T cell activation 8, however, only one study with human peripheral T cells has shown that HA enhances CD3-mediated T cell activation 69. HA binding by CD44 may help mediate the interaction between dendritic cells and T cells 70,71 as HA is synthesized and expressed by dendritic cells 72 and reduced conjugate formation is observed in vitro when CD44 null T cells are mixed with mature dendritic cells 70,71. However, since naïve T cells do not bind detectable levels of Fl-HA, it is not clear to what extent this interaction is important for naïve T cell activation. HA and HA oligosaccharides can also induce dendritic cell maturation, but this occurs in a CD44-independent, toll-like receptor-4 (TLR-4)-dependent manner 73. To date, the best defined role for CD44 on activated T cells is its ability to mediate rolling on HA and on activated endothelial cells under flow conditions 74. This is discussed in more detail in the next section. The function of CD44 in the immune response began to emerge with the investigation of mouse models of disease using either CD44 antibodies or CD44 null mice (reviewed in 75,76). Each approach has its limitations, with the CD44 mAb, IM7, able to induce rapid depletion of neutrophils from the circulation 77, while possible compensation effects may occur in the CD44 null mice 56. Nevertheless, both approaches have provided valuable insights into the in vivo function of CD44 and HA during an immune response. While the majority of evidence indicates a pro-inflammatory role for CD44 59,62, some disease models reveal a role for CD44 in the resolution of inflammation 78. Here we describe the functions of CD44 in the development and termination of an inflammatory immune response. These are summarized in Table 3. Leukocyte extravasation to inflammatory sites involves a series of discrete steps: tethering and rolling, adhesion, diapedesis and migration (reviewed in 79-82). Firstly, leukocytes are captured from the blood by an initial tethering and rolling interaction. This reduces the velocity of the cell, allowing a greater opportunity for additional interactions with immobilized chemokines on the endothelial cell, which together with the rolling interaction, signal to upregulate integrin function. This leads to firm adhesion and cell arrest, followed by diapedesis and migration into the inflamed tissue. Selectins and their ligands, as well as CD44 and HA have been implicated in the initial rolling interaction leading to integrin-mediated adhesion (reviewed in 83,84 and see Fig. 2). While selectin expression on endothelial cells can be induced within hours of an inflammatory stimulus, and integrins activated by chemokine signals within minutes, the induction of HA binding by CD44 on T cells and monocytes is typically a slower process, requiring protein synthesis and up to three days to achieve maximal HA binding on the majority of cells. Although this slower upregulation may make some sense for T cells, which are first activated in the lymph node to proliferate prior to becoming effector T cells and migrating to the site of infection, the significance of the slower kinetics in monocytes is not understood. One would predict that optimal HA binding for monocytes would occur in the tissue, not in the blood. T lymphocyte rolling on endothelium can be mediated by CD44. The interaction between CD44 on T cells and hyaluronan on the surface of the endothelium is sufficient for the initial “rolling” interaction, which is required for the extravasation to tissues. 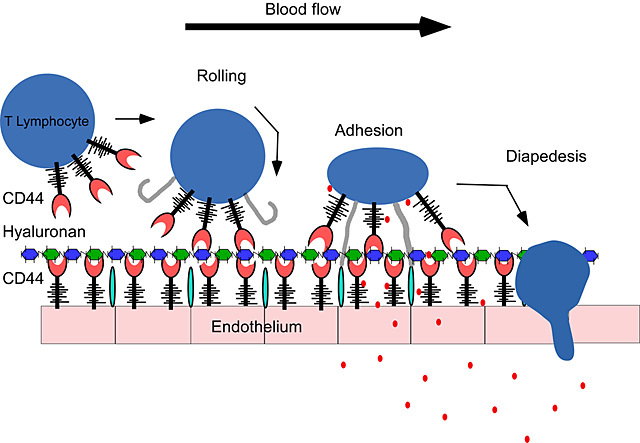 This rolling interaction, together with chemokines ( ) facilitates firm adhesion, mediated by the integrins ( ) and their counter receptors ( ) on endothelial cells which then leads to diapedesis and migration to the site of inflammation and infection. The mechanisms and molecules used to recruit leukocytes to inflammatory sites differ depending on the organ and the leukocyte being recruited 85,86. In some organs, there is evidence to suggest that CD44 and HA can exert a pro-inflammatory role by facilitating leukocyte recruitment to inflammatory sites, thereby promoting chronic inflammatory disease. Siegelman’s group has contributed significantly to this area, making the initial key observation that T cells can roll on endothelial cells in a CD44- and HA-dependent manner 74,87. Inflammatory agents upregulate the expression of CD44 and HA on the surface of microvascular endothelial cells and induce HA binding, thereby allowing endothelial cell CD44 to present HA to the T cell and mediate CD44 dependent rolling 42,88. This and previous data 14 led to the proposal of a “sandwich” interaction model: CD44-HA-CD44 (see Fig. 3). The "sandwich" model. A CD44:HA:CD44 mediated cell:cell interaction. Here CD44 expressed on activated T cells binds to hyaluronan presented on the surface of endothelial cells by CD44. The level of hyaluronan expressed by endothelial cells is increased in inflammatory conditions. Siegelman’s group then went on to demonstrate an effect of CD44 and HA in the in vivo extravasation of superantigen activated T cells to the peritoneum 62. CD44 was also required for subsequent firm adhesion mediated by the α4β1 integrin (VLA-4) and this required the cytoplasmic domain of CD44 89. This work implied that activated T cells could roll on HA induced on inflamed endothelial cells to facilitate extravasation to the inflamed site. Kubes’ group was the first to show CD44- and HA-dependent rolling and adherence in vivo with Th1 and Th2 cells in a mouse model of TNFα-activated endothelium 60. Consistent with the sandwich model, CD44 was required on both the endothelial cell and the T cell. A role for CD44 and HA in leukocyte extravasation had also been suggested by analysis of CD44 null mice and CD44 antibody studies in several models of chronic inflammatory diseases (reviewed in 75). The CD44 mAb, IM7 does not bind directly to the HA binding site of CD44 90, yet this antibody has dramatic effects in vivo. 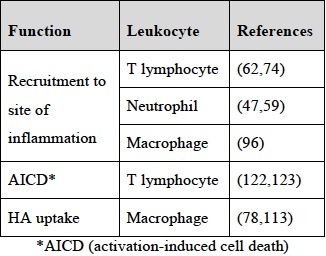 Given the recent finding that in vivo administration of IM7 can lead to leukocyte depletion 77, one should be cautious in the interpretation of studies using this antibody. However, in some mouse models of chronic inflammation, data from CD44 null mice and CD44 antibody studies both support a pro-inflammatory function for CD44 in T cell recruitment to sites of chronic inflammation (see Table 4). Early studies from Mikecz and colleagues identified an inhibitory function for IM7 in leukocyte infiltration in a mouse model of rheumatoid arthritis 91 and further studies in a mouse model of collagen-induced arthritis showed that CD44 null mice had significant reductions in both the incidence and severity of the disease 92. Using adoptive transfer to analyze T cell trafficking patterns, it was found that CD44 negative T cells had delayed entry into the joints of arthritic mice, suggesting that CD44 was affecting arthritis by facilitating leukocyte traffic to the site of inflammation 55,92. In models of experimental autoimmune encephalomyelitis (EAE), administration of antibodies against CD44 and the VLA-4 integrin reduced T cell trafficking to the spinal cord 93 and brain 94 and prevented the development of EAE. Interestingly, as CD44-dependent extravasation to superantigen-inflamed peritoneum requires firm adhesion mediated by VLA-4 89,95, it raises the possibility that a cooperative interaction between CD44 and VLA-4 may be involved in T cell recruitment to the central nervous system. CD44 may also be important for the recruitment of other leukocytes to sites of inflammation 59,96,97. Neutrophil accumulation in the tissues is reduced in CD44 null mice in a chemokine model of recruitment 59 and within liver sinusoids of endotoxemic mice 47. Reduced recruitment of CD44 null macrophages to atherosclerotic lesions 96 and into inflamed lungs following LPS inhalation 98 has also been observed, and HA can recruit macrophages to the site of damage 99. However, a defect in the recruitment of neutrophils or macrophages is not observed in CD44 null mice during bleomycin-induced lung inflammation 78 and a persistent increased neutrophil recruitment occurs in the inflamed lungs of CD44 null mice after Mycobacterium tuberculosis infection 100 or upon Escherichia coli-induced pneumonia 101. How CD44 and HA influence neutrophil recruitment to inflammatory sites may differ from that of T cells. Unlike T cells, neutrophils and macrophages are activated in the tissues, and unstimulated neutrophils and monocytes present in the blood do not bind significant levels of soluble Fl-HA, suggesting that CD44 and HA may not be involved in the initial recruitment. Besides a defect in adhesion, migration deficiencies in CD44 null neutrophils 59,102 and macrophages 98 have been reported in vitro, and for macrophages 98 but not neutrophils 59 in vivo. Thus a defect in migration may contribute to reduced recruitment. 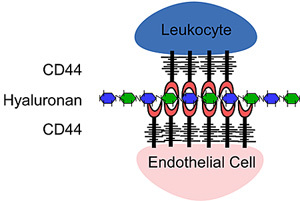 Other possibilities are that leukocyte CD44 is required for firm adhesion, perhaps via its effect on VLA-4, or perhaps endothelial cell CD44 helps immobilize chemokines, which trigger firm adhesion and lead to subsequent migration. Proteoglycan-modified CD44 or proteoglycans bound to HA on endothelial cells may immobilize chemokines, thereby promoting integrin activation and leukocyte adhesion 103. MIP-1β for example, can bind to endothelial cells and to the proteoglycan form of CD44 and this promotes T cell adhesion 104. 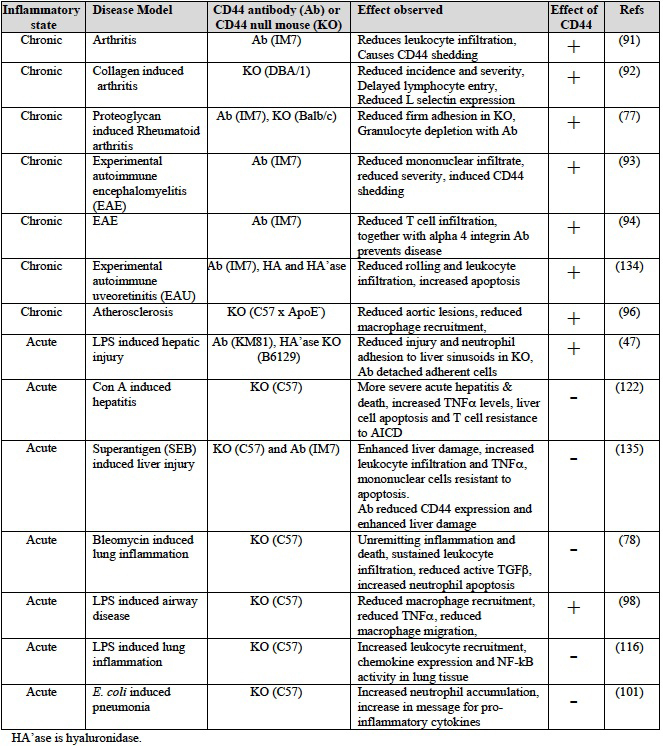 While most chronic inflammatory models of disease indicate a pro-inflammatory role for CD44 and HA, most models of acute inflammation involving tissue injury indicate a role for CD44 in the resolution of inflammation (see Table 4). In a bleomycin-induced lung injury model of acute inflammation in which mice normally recover, 75% of CD44 null mice die within 2 weeks 78. The increase in death was attributed to a failure to resolve the inflammation, characterized by reduced activation of transforming growth factor-β1 (TGF-β1), impaired removal of apoptotic neutrophils, and accumulation of both high molecular mass and fragmented hyaluronan. Active TGF-β1 is crucial for downregulating the immune response and promoting tissue repair in many experimental systems 105, including lung injury 106. TGF-β1 is secreted in a latent form that is activated by proteolysis 107. In keratinocytes, MMP-9 localization to the cell surface is CD44 dependent and can lead to TGF-β1 activation 108, raising the possibility that CD44 may help promote TGF-β1 activation. Indeed, CD44 promoted TGF-β1 activation and directional migration in fibroblasts 109, both of which promote wound healing. HA can be cleaved by hyaluronidases and reactive oxygen/nitrogen species, and this, combined with increased hyaluronan synthesis, leads to the accumulation of HA and HA fragments at inflammatory sites (reviewed in 110,111). The majority of HA is normally turned over in the tissues by removal via the lymphatic system. However, local turnover of HA can account for over 25% of HA degradation 112. CD44 expression by alveolar macrophages has been implicated in the local turnover of HA in the lungs 113,114. Consistent with this, HA accumulation in the lungs of CD44 null mice treated with bleomycin was reduced in chimeric CD44 null mice reconstituted with CD44+ bone marrow 78. As fragmented HA can activate cells through TLR-2 and -4 115, these studies suggest an important role for CD44 in the removal of inflammatory HA fragments and restoration of HA homeostasis. CD44 can also negatively regulate TLR-4 signaling 116,117, suggesting another means to down-regulate the inflammatory response. Although CD44 has been suggested to be a phagocytic receptor for CD44 antibody coated beads 118, subsequent work suggested that CD44 mAbs have an indirect effect on phagocytosis by activating the complement receptor-3 driven phagocytic pathway 119. Other work has shown that incubating macrophages with an anti-CD44 mAb can increase their phagocytosis of apoptotic neutrophils 120, raising the possibility that CD44 may indirectly affect the efficient removal of apoptotic neutrophils, a necessary step in the resolution of an inflammatory response. There is also evidence that CD44 is involved in activation-induced cell death (AICD). AICD is responsible for the removal of activated T cells and restoration of immune homeostasis 121. High molecular mass HA can induce AICD in a subpopulation of activated T cells in vitro 41. In vivo, the lack of CD44-dependent AICD has been associated with increased severity of a delayed type hypersensitivity response and concanavalin A-induced hepatitis in CD44-deficient mice 122,123. The absence of CD44 also exacerbates the lymphoproliferative symptoms found in mice that do not express Fas, the receptor primarily responsible for AICD 124. Thus, despite the prominent role that Fas plays in AICD and a report that CD44 crosslinking can increase surface expression of Fas in primary human T cells 125, data from primary mouse T cells 124 and human Jurkat T cells 41 shows that CD44-mediated AICD occurs by a Fas-independent mechanism. HA can increase AICD in CD44+, but not CD44 negative T cells activated in vitro 41. In addition, the extent of HA-induced cell death in human Jurkat T cells is dependent upon the extent of HA binding: high HA binding cells are more susceptible to death than low HA binding cells and high but not low molecular mass HA, enhances AICD. This suggests that the strength or degree of HA binding by CD44 can affect the biological outcome. Furthermore, as high molecular mass HA is a characteristic of normal, undamaged, uninfected tissue, it makes sense that it can trigger the death of activated T cells to promote tissue homeostasis. The interaction between CD44 and its multivalent ligand HA is unique in that it can range from a low affinity, low avidity interaction to a high affinity, high avidity interaction. There is some evidence to suggest that the strength of the interaction may affect the biological outcome. For example, Th1 and Th2 cells with low HA binding avidity can roll on HA whereas high HA binding on activated T cells can trigger cell death. Although we cannot exclude a role for CD44 and HA in immune cell development and homeostasis, most of the evidence to date has pointed towards the importance of the interaction in regulating the immune response. This is supported by the fact that the majority of immune cells don’t bind HA until they are activated by an antigenic or inflammatory agent. There is evidence that CD44 and HA can play a pro-inflammatory role in facilitating leukocyte recruitment to inflammatory sites, although the mechanism may differ between T cells and neutrophils. The extent to which CD44 and HA are important in this process may be organ and disease specific. CD44 can also play a role in the resolution of inflammation and restoration of HA and tissue homeostasis. CD44 on activated macrophages may assist in the removal of inflammatory HA fragments, and the binding of high molecular mass HA to activated T cells may facilitate their removal and the restoration of tissue homeostasis. Our research on CD44 was supported by the Heart and Stroke Foundation of B. C. and Yukon, the Canadian Institutes of Health Research and the National Science and Engineering Council of Canada. Brian Ruffell was funded by a graduate fellowship from the Heart and Stroke Foundation of Canada. 1. Camenisch, T. D., Spicer, A. P., Brehm-Gibson, T., Biesterfeldt, J., Augustine, M. L., Calabro, A., Jr., Kubalak, S., Klewer, S. E., McDonald, J. A. Disruption of hyaluronan synthase-2 abrogates normal cardiac morphogenesis and hyaluronan-mediated transformation of epithelium to mesenchyme. J Clin Invest 106, 349-360, 2000. Toole, B. P. Hyaluronan and its binding proteins, the hyaladherins. Curr. Opin. Cell Biol. 2, 839-844, 1990. 3. Milner, C. M., Day, A. J. TSG-6: a multifunctional protein associated with inflammation. J Cell Sci 116, 1863-1873, 2003. 4. Zhou, B., Weigel, J. A., Saxena, A., Weigel, P. H. Molecular cloning and functional expression of the rat 175-kDa hyaluronan receptor for endocytosis. Mol Biol Cell 13, 2853-2868, 2002. Huang, L., Yoneda, M., Kimata, K. A Serum-Derived Hyaluronan-Associated Protein (SHAP) Is the Heavy Chain of the Inter alpha-trypsin Inhibitor. J Biol Chem 268, 26725-26730, 1993. 6. Jackson, D. G. Biology of the lymphatic marker LYVE-1 and applications in research into lymphatic trafficking and lymphangiogenesis. Apmis 112, 526-538, 2004. Ponta, H., Sherman, L., Herrlich, P. A. CD44: from adhesion molecules to signalling regulators. Nat. Rev. Mol. Cell. Biol. 4, 33-45, 2003. 8. Lesley, J., Hyman, R., and Kincade, P. W. CD44 and its interaction with extracellular matrix. Adv Immunol 54, 271-335, 1993. 9. Jalkanen, S., Jalkanen, M., Bargatze, R., Tammi, M., Butcher, E. C. Biochemical properties of glycoproteins involved in lymphocyte recognition of high endothelial venules in man. J. Immunol. 141, 1615-1623, 1988. 10. Brown, T. A., Bouchard, T., St. John, T., Wayner, E., and Carter, W. G. Human keratinocytes express a new CD44 core protein (CD44E) as a heparan-sulfate intrinsic membrane proteoglycan with additional exons. J. Cell Biol. 113, 207-221, 1991. 11. Takahashi, K., Stamenkovic, I., Cutler, M., Dasgupta, A., Tanabe, K. K. Keratan sulfate modification of CD44 modulates adhesion to hyaluronate. J. Biol. Chem. 271, 9490-9496, 1996. 12. Lesley, J., English, N., Perschl, A., Gregoroff, J., Hyman, R. Variant cell lines selected for alterations in the function of the hyaluronan receptor CD44 show differences in glycosylation. J Exp Med 182, 431-437, 1995. 13. Katoh, S., Zheng, Z., Oritani, K., Shimozato, T., Kincade, P. W. Glycosylation of CD44 negatively regulates its recognition of hyaluronan. J. Exp. Med. 182, 419-429, 1995. Maiti, A., Maki, G., Johnson, P. TNF-alpha induction of CD44-mediated leukocyte adhesion by sulfation. Science 282, 941-943, 1998. 15. Delcommenne, M., Kannagi, R., and Johnson, P. TNF-alpha increases the carbohydrate sulfation of CD44: induction of 6-sulfo N-acetyl lactosamine on N- and O-linked glycans. Glycobiology 12, 613-622, 2002. 16. Spring, F. A., Dalchau, R., Daniels, G. L., Mallinson, G., Judson, P. A., Parsons, S. F., Fabre, J. W., Anstee, D. J. The Ina and Inb blood group antigens are located on a glycoprotein of 80,000 MW (the CDw44 glycoprotein) whose expression is influenced by the In(Lu) gene. Immunology 64, 37-43, 1988. 17. Katayama, Y., Hidalgo, A., Chang, J., Peired, A., Frenette, P. S. CD44 is a physiological E-selectin ligand on neutrophils. J Exp Med 201:1183-1189, 2005. 18. Dimitroff, C. J., Lee, J. Y., Fuhlbrigge, R. C., Sackstein, R. A distinct glycoform of CD44 is an L-selectin ligand on human hematopoietic cells. Proc. Natl. Acad. Sci. USA 97, 13841-13846 , 2000. 19. Dimitroff, C. J., Lee, J. Y., Rafii, S., Fuhlbrigge, R. C., Sackstein, R. CD44 is a major E-selectin ligand on human hematopoietic progenitor cells. J. Cell Biol. 153, 1277-1286, 2001. 20. Banerji, S., Wright, A. J., Noble, M., Mahoney, D. J., Campbell, I. D., Day, A. J., Jackson, D. G. Structures of the CD44-hyaluronan complex provide insight into a fundamental carbohydrate-protein interaction. Nat Struct Mol Biol 14, 234-239, 2007. 21. Lesley, J., He, Q., Miyake, K., Hamann, A., Hyman, R., Kincade, P. W. Requirements for hyaluronic acid binding by CD44: a role for the cytoplasmic domain and activation by antibody. J Exp Med 175, 257-266, 1992. 22. Lesley, J., Hascall, V. C., Tammi, M., Hyman, R. Hyaluronan binding by cell surface CD44. J Biol Chem 275, 26967-26975, 2000. 23. Lesley, J., Hyman, R. CD44 can be activated to function as an hyaluronic acid receptor in normal murine T cells. Eur J Immunol 22, 2719-2723, 1992. 24. Kincade, P. W., Zheng, Z., Katoh, S., Hanson, L. The importance of cellular environment to function of the CD44 matrix receptor. Curr. Opin. Cell Biol. 9, 635-642, 1997. 25. Lesley, J., Hyman, R., English, N., Catterall, J. B., Turner, G. A. CD44 in inflammation and metastasis. Glycoconj J 14, 611-622, 1997. 26. Lesley, J., Hyman, R. CD44 structure and function. Front Biosci 3, 616-630, 1998. 27. Greenfield, B., Wang, W. C., Marquardt, H., Piepkorn, M., Wolff, E. A., Aruffo, A., Bennett, K. L. Characterization of the heparan sulfate and chondroitin sulfate assembly sites in CD44. J. Biol. Chem. 274, 2511-2517, 1999. 28. Ruffell, B., Johnson, P. Chondroitin sulfate addition to CD44H negatively regulates hyaluronan binding. Biochem Biophys Res Commun 334, 306-312, 2005. 29. English, N. M., Lesley, J. F., Hyman, R. Site-specific de-N-glycosylation of CD44 can activate hyaluronan binding, and CD44 activation states show distinct threshold densities for hyaluronan binding. Cancer Research 58, 3736-3742, 1998. 30. Skelton, T. P., Zeng, C. X., Nocks, A., Stamenkovic, I. Glycosylation provides both stimulatory and inhibitory effects on cell surface and soluble CD44 binding to hyaluronan. J. Cell Biol. 140, 431-446, 1998. 31. Toyama-Sorimachi, N., Sorimachi, H., Tobita, Y., Kitamura, F., Yagita, H., Suzuki, K., Miyasaka, M. A novel ligand for CD44 is serglycin, a hematopoietic cell lineage-specific proteoglycan. J. Biol. Chem. 270, 7437-7444, 1995. 32. Naujokas, M. F., Morin, M., Anderson, M. S., Peterson, M., Miller, J. The chondroitin sulfate form of invariant chain can enhance stimulation of T cell responses through interaction with CD44. Cell 74, 257-268, 1993. 33. Bourguignon, L. Y. W., Lokeshwar, V. B., Chen, X., Kerrick, W. G. L. Hyaluronic acid-induced lymphocyte signal transduction and HA receptor (GP85/CD44)-cytoskeleton interaction. J. Immunol. 151, 6634-6644, 1993. 34. Brown, K. L., Birkenhead, D., Lai, J. C., Li, L., Li, R., Johnson, P. Regulation of hyaluronan binding by F-actin and colocalization of CD44 and phosphorylated ezrin/radixin/moesin (ERM) proteins in myeloid cells. Exp. Cell Res. 303, 400-414, 2005. 35. Liu, D., Zhang, D., Mori, H., Sy, M.-S. Binding of CD44 to hyaluronic acid can be induced by multiple signals and requires the CD44 cytoplasmic domain. Cell. Immunol. 174, 73-83, 1996. 36. Tsukita, S., Oishi, K., Sato, N., Sagara, J., Kawai, A., Tsukita, S. ERM family members as molecular linkers between the cell surface glycoprotein CD44 and actin-based cytoskeletons. J. Cell Biol. 126, 391-401, 1994. 37. Lesley, J., Kincade, P. W., Hyman, R. Antibody-induced activation of the hyaluronan receptor function of CD44 requires multivalent binding by antibody. Eur J Immunol 23, 1902-1909, 1993. 38. Katoh, S., Miyagi, T., Taniguchi, H., Matsubara, Y., Kadota, J., Tominaga, A., Kincade, P. W., Matsukura, S., Kohno, S. Cutting edge: An inducible sialidase regulates the hyaluronic acid binding ability of CD44-bearing human monocytes. J. Immunol. 162, 5058-5061, 1999. 39. Levesque, M. C., Haynes, B. F. Cytokine induction of the ability of human monocyte CD44 to bind hyaluronan is mediated primarily by TNF-alpha and is inhibited by IL-4 and IL-13. J. Immunol. 159, 6184-6194, 1997. 40. Levesque, M. C., Haynes, B. F. TNF alpha and IL-4 regulation of hyaluronan binding to monocyte CD44 involves posttranslational modification of CD44. Cell. Immunol. 193, 209-218, 1999. 41. Ruffell, B., Johnson, P. Hyaluronan induces cell death in activated T cells through CD44. J. Immunol. 181: 7044-7054, 2008. 42. Mohamadzadeh, M., Degrendele, H., Arizpe, H., Estess, P., Siegelman, M. Proinflammatory stimuli regulate endothelial hyaluronan expression and CD44/HA-dependent primary adhesion. J. Clin. Invest. 101, 97-108, 1998. 43. Lesley, J., Gal, I., Mahoney, D. J., Cordell, M. R., Rugg, M. S., Hyman, R., Day, A. J., Mikecz, K. TSG-6 modulates the interaction between hyaluronan and cell surface CD44. J Biol Chem 279, 25745-25754, 2004. 44. Zhuo, L., Kanamori, A., Kannagi, R., Itano, N., Wu, J., Hamaguchi, M., Ishiguro, N., Kimata, K. SHAP potentiates the CD44-mediated leukocyte adhesion to the hyaluronan substratum. J Biol Chem 281:20303-20314, 2006. 45. de La Motte, C. A., Hascall, V. C., Calabro, A., Yen-Lieberman, B., Strong, S. A. Mononuclear leukocytes preferentially bind via CD44 to hyaluronan on human intestinal mucosal smooth muscle cells after virus infection or treatment with poly(I.C). J Biol Chem 274, 30747-30755, 1999. 46. de la Motte, C. A., Hascall, V. C., Drazba, J., Bandyopadhyay, S. K., Strong, S. A. Mononuclear leukocytes bind to specific hyaluronan structures on colon mucosal smooth muscle cells treated with polyinosinic acid:polycytidylic acid: inter-alpha-trypsin inhibitor is crucial to structure and function. Am J Pathol 163, 121-133, 2003. McDonald, B., McAvoy, E. F., Lam, F., Gill, V., de la Motte, C., Savani, R. C., Kubes, P. Interaction of CD44 and hyaluronan is the dominant mechanism for neutrophil sequestration in inflamed liver sinusoids. J Exp Med 205, 915-927, 2008. 48. Sackstein, R. The bone marrow is akin to skin: HCELL and the biology of hematopoietic stem cell homing. J Investig Dermatol Symp Proc 9, 215-223, 2004. 49. Avigdor, A., Goichberg, P., Shivtiel, S., Dar, A., Peled, A., Samira, S., Kollet, O., Hershkoviz, R., Alon, R., Hardan, I., Ben-Hur, H., Naor, D., Nagler, A., Lapidot, T. CD44 and hyaluronic acid cooperate with SDF-1 in the trafficking of human CD34+ stem/progenitor cells to bone marrow. Blood 103, 2981-2989, 2004. 50. Haylock, D. N., Nilsson, S. K. The role of hyaluronic acid in hemopoietic stem cell biology. Regen Med 1, 437-445, 2006. 51. Schmits, R., Filmus, J., Gerwin, N., Senaldi, G., Kiefer, F., Kundig, T., Wakeham, A., Shahinian, A., Catzavelos, C., Rak, J., Furlonger, C., Zakarian, A., Simard, J. J. L., Ohashi, P. S., Paige, C. J., Gutierrezramos, J. C., Mak, T. W. CD44 regulates hematopoietic progenitor distribution, granuloma formation and tumorigenicity. Blood 90, 2217-2233, 1997. 52. Protin, U., Schweighoffer, T., Jochum, W., Hilberg, F. CD44-deficient mice develop normally with changes in subpopulations and recirculation of lymphocytes subsets. J. Immunol. 163, 4917-4923, 1999. 53. Wu, L., Kincade, P. W., Shortman, K. The CD44 expressed on the earliest intrathymic precursor population functions as a thymus homing molecule but does not bind to hyaluronate. Immunol Lett 38, 69-75, 1993. 54. Jalkanen, S. T., Bargatze, R. F., de los Toyos, J., Butcher, E. C. Lymphocyte recognition of high endothelium: antibodies to distinct epitopes of an 85-95 kD glycoprotein antigen differentially inhibit lymphocyte binding to lymph node, mucosal or synovial endothelial cells. J. Cell Biol. 105, 983-990, 1987. 55. Stoop, R., Gal, I., Glant, T. T., McNeish, J. D., Mikecz, K. Trafficking of CD44-deficient murine lymphocytes under normal and inflammatory conditions. Eur J Immunol 32, 2532-2542, 2002. 56. Nedvetzki, S., Gonen, E., Assayag, N., Reich, R., Williams, R. O., Thurmond, R. L., Huang, J. F., Neudecker, B. A., Wang, F. S., Turley, E. A., Naor, D. RHAMM, a receptor for hyaluronan-mediated motility, compensates for CD44 in inflamed CD44-knockout mice: a different interpretation of redundancy. Proc Natl Acad Sci USA 101, 18081-18086, 2004. 57. Budd, R. C., Cerottini, J. C., Horvath, C., Bron, C., Pedrazzini, T., Howe, R. C., MacDonald, H. R. Distinction of virgin and memory T lymphocytes. Stable acquisition of the Pgp-1 glycoprotein concomitant with antigenic stimulation. J Immunol 138, 3120-3129, 1987. 58. Brown, K. L., Maiti, A., Johnson, P. Role of sulfation in CD44-mediated hyaluronan binding induced by inflammatory mediators in human CD14+ peripheral blood monocytes. J. Immunol. 167, 5367-5374, 2001. 59. Khan, A. I., Kerfoot, S. M., Heit, B., Liu, L., Andonegui, G., Ruffell, B., Johnson, P., Kubes, P. Role of CD44 and hyaluronan in neutrophil recruitment. J Immunol 173, 7594-7601, 2004. 60. Bonder, C. S., Clark, S. R., Norman, M. U., Johnson, P., Kubes, P. Use of CD44 by CD4+ Th1 and Th2 lymphocytes to roll and adhere. Blood 107, 4798-4806, 2006. 61. Lesley, J., Howes, N., Perschl, A., Hyman, R. Hyaluronan binding function of CD44 is transiently activated on T cells during an in vivo immune response. J Exp Med 180, 383-387, 1994. 62. DeGrendele, H. C., Estess, P., Siegelman, M. H. Requirement for CD44 in activated T cell extravasation into an inflammatory site. Science 278, 672-675, 1997. 63. Seth, A., Gote, L., Nagarkatti, M., Nagarkatti, P. S. T-cell-receptor-independent activation of cytolytic activity of cytotoxic T lymphocytes mediated through CD44 and gp90MEL-14. Proc Natl Acad Sci USA 88, 7877-7881, 1991. 64. Sconocchia, G., Titus, J. A., Segal, D. M. CD44 is a cytotoxic triggering molecule in human peripheral blood NK cells. J Immunol 153, 5473-5481, 1994. 65. Larkin, J., Renukaradhya, G. J., Sriram, V., Du, W., Gervay-Hague, J., Brutkiewicz, R. R. CD44 differentially activates mouse NK T cells and conventional T cells. J Immunol 177, 268-279, 2006. 66. Matsumoto, G., Nghiem, M. P., Nozaki, N., Schmits, R., Penninger, J. M. Cooperation between CD44 and LFA-1/CD11a adhesion receptors in lymphokine-activated killer cell cytotoxicity. J Immunol 160, 5781-5789, 1998. 67. Firan, M., Dhillon, S., Estess, P., and Siegelman, M. H. Suppressor activity and potency among regulatory T cells is discriminated by functionally active CD44. Blood 107, 619-627, 2006. 68. Bollyky, P. L., Lord, J. D., Masewicz, S. A., Evanko, S. P., Buckner, J. H., Wight, T. N., Nepom, G. T. Cutting Edge: High Molecular Weight Hyaluronan Promotes the Suppressive Effects of CD4+CD25+ Regulatory T Cells. J Immunol 179, 744-747, 2007. 69. Galandrini, R., Galluzzo, E., Albi, N., Grossi, C. E., Velardi, A. Hyaluronate is costimulatory for human T cell effector functions and binds to CD44 on activated T cells. J. Immunol. 153, 21-31, 1994. 70. Do, Y., Nagarkatti, P. S., Nagarkatti, M. Role of CD44 and hyaluronic acid (HA) in activation of alloreactive and antigen-specific T cells by bone marrow-derived dendritic cells. J Immunother 27, 1-12, 2004. 71. Hegde, V. L., Singh, N. P., Nagarkatti, P. S., and Nagarkatti, M. CD44 mobilization in allogeneic dendritic cell-T cell immunological synapse plays a key role in T cell activation. J Leukoc Biol 84:134-142, 2008. 72. Mummert, M. E., Mummert, D., Edelbaum, D., Hui, F., Matsue, H., Takashima, A. Synthesis and surface expression of hyaluronan by dendritic cells and its potential role in antigen presentation. J Immunol 169, 4322-4331, 2002. 73. Termeer, C., Benedix, F., Sleeman, J., Fieber, C., Voith, U., Ahrens, T., Miyake, K., Freudenberg, M., Galanos, C., Simon, J. C. Oligosaccharides of Hyaluronan activate dendritic cells via toll-like receptor 4. J Exp Med 195, 99-111, 2002. 74. DeGrendele, H. C., Estess, P., Picker, L. J., Siegelman, M. H. CD44 and its ligand hyaluronate mediate rolling under physiologic flow - a novel lymphocyte-endothelial cell primary adhesion pathway. J. Exp. Med. 183, 1119-1130, 1996. 75. Pure, E., Cuff, C. A. A crucial role for CD44 in inflammation. Trends Mol. Med. 7, 213-221, 2001. 76. Naor, D., Nedvetzki, S., Walmsley, M., Yayon, A., Turley, E. A., Golan, I., Caspi, D., Sebban, L. E., Zick, Y., Garin, T., Karussis, D., Assayag-Asherie, N., Raz, I., Weiss, L., Slavin, S., Golan, I. CD44 involvement in autoimmune inflammations: the lesson to be learned from CD44-targeting by antibody or from knockout mice. Ann N Y Acad Sci 1110, 233-247, 2007. Hutas, G., Bajnok, E., Gal, I., Finnegan, A., Glant, T. T., Mikecz, K. CD44-specific antibody treatment and CD44 deficiency exert distinct effects on leukocyte recruitment in experimental arthritis. Blood, published on line, ahead of print, 2008). 78. Teder, P., Vandivier, R. W., Jiang, D., Liang, J., Cohn, L., Pure, E., Henson, P. M., Noble, P. W. Resolution of lung inflammation by CD44. Science 296, 155-158, 2002. 79. Butcher, E. C. Leukocyte-endothelial cell recognition: three (or more) steps to specificity and diversity. Cell 67, 1033-1036, 1991. 80. Springer, T. A. Traffic signals for lymphocyte recirculation and leukocyte emigration. Cell 76, 301-314, 1994. 81. Miyasaka, M., Tanaka, T. Lymphocyte trafficking across high endothelial venules: dogmas and enigmas. Nat Rev Immunol 4, 360-370, 2004. 82. Luster, A. D., Alon, R., von Andrian, U. H. Immune cell migration in inflammation: present and future therapeutic targets. Nat Immunol 6, 1182-1190, 2005. 83. Ley, K. Molecular mechanisms of leukocyte recruitment in the inflammatory process. Cardiovasc Res 32, 733-742, 1996. 84. Johnson, P., Maiti, A., Brown, K. L., Li, R. A role for the cell adhesion molecule CD44 and sulfation in leukocyte-endothelial cell adhesion during an inflammatory response? Biochem. Pharm. 59, 455-465, 2000. 85. Kubes, P. The complexities of leukocyte recruitment. Semin Immunol 14, 65-72, 2002. 86. Liu, L., Kubes, P. Molecular mechanisms of leukocyte recruitment: organ-specific mechanisms of action. Thromb Haemost 89, 213-220, 2003. 87. Clark, R. A., Alon, R., Springer, T. A. CD44 and hyaluronan-dependent rolling interactions of lymphocytes on tonsillar stroma. J Cell Biol 134, 1075-1087, 1996. 88. Nandi, A., Estess, P., Siegelman, M. H. Hyaluronan anchoring and regulation on the surface of vascular endothelial cells is mediated through the functionally active form of CD44. J. Biol. Chem. 275, 14939-14948, 2000. Nandi, A., Estess, P., Siegelman, M. Bimolecular Complex between Rolling and Firm Adhesion Receptors Required for Cell Arrest; CD44 Association with VLA-4 in T Cell Extravasation. Immunity 20, 455-465, 2004. 90. Zheng, Z., Katoh, S., He, Q., Oritani, K., Miyake, K., Lesley, J., Hyman, R., Hamik, A., Parkhouse, R. M., Farr, A. G., et al. Monoclonal antibodies to CD44 and their influence on hyaluronan recognition. J Cell Biol 130, 485-495, 1995. 91. Mikecz, K., Brennan, F. R., Kim, J. H., Glant, T. T. Anti-CD44 Treatment Abrogates Tissue Oedema and Leukocyte Infiltration In Murine Arthritis. Nat. Med. 1, 558-563, 1995. 92. Stoop, R., Kotani, H., McNeish, J. D., Otterness, I. G., Mikecz, K. Increased resistance to collagen-induced arthritis in CD44-deficient DBA/1 mice. Arthritis Rheum 44, 2922-2931, 2001. 93. Brennan, F. R., O'Neill, J. K., Allen, S. J., Butter, C., Nuki, G., Baker, D. CD44 is involved in selective leucocyte extravasation during inflammatory central nervous system disease. Immunology 98, 427-435, 1999. Brocke, S., Piercy, C., Steinman, L., Weissman, I. L., Veromaa, T. Antibodies to CD44 and integrin alpha(4), but not L-selectin, prevent central nervous system inflammation and experimental encephalomyelitis by blocking secondary leukocyte recruitment. Proc Natl Acad Sci USA 96, 6896-6901, 1999. 95. Siegelman, M. H., Stanescu, D., Estess, P. The CD44-initiated pathway of T-cell extravasation uses VLA-4 but not LFA-1 for firm adhesion. J. Clin. Invest. 105, 683-691, 2000. 96. Cuff, C. A., Kothapalli, D., Azonobi, I., Chun, S., Zhang, Y., Belkin, R., Yeh, C., Secreto, A., Assoian, R. K., Rader, D. J., Pure, E. The adhesion receptor CD44 promotes atherosclerosis by mediating inflammatory cell recruitment and vascular cell activation. J Clin Invest 108, 1031-1040, 2001. 97. Katoh, S., Matsumoto, N., Kawakita, K., Tominaga, A., Kincade, P. W., Matsukura, S. A role for CD44 in an antigen-induced murine model of pulmonary eosinophilia. J Clin Invest 111, 1563-1570, 2003. 98. Hollingsworth, J. W., Li, Z., Brass, D. M., Garantziotis, S., Timberlake, S. H., Kim, A., Hossain, I., Savani, R. C., Schwartz, D. A. CD44 Regulates Macrophage Recruitment to the Lung in Lipopolysaccharide-Induced Airway Disease. Am J Respir Cell Mol Biol 37, 248-253, 2007. 99. Jameson, J. M., Cauvi, G., Sharp, L. L., Witherden, D. A., Havran, W. L. Gammadelta T cell-induced hyaluronan production by epithelial cells regulates inflammation. J Exp Med 201, 1269-1279, 2005. 100. Kipnis, A., Basaraba, R. J., Turner, J., Orme, I. M. Increased neutrophil influx but no impairment of protective immunity to tuberculosis in mice lacking the CD44 molecule. J Leukoc Biol 74, 992-997, 2003. 101. Wang, Q., Teder, P., Judd, N. P., Noble, P. W., Doerschuk, C. M. CD44 deficiency leads to enhanced neutrophil migration and lung injury in Escherichia coli pneumonia in mice. Am J Pathol 161, 2219-2228, 2002. 102. Alstergren, P., Zhu, B., Glougauer, M., Mak, T. W., Ellen, R. P., Sodek, J. Polarization and directed migration of murine neutrophils is dependent on cell surface expression of CD44. Cell Immunol 231, 146-157, 2004. 103. Tanaka, Y., Adams, D. H., Shaw, S. Proteoglycans on endothelial cells present adhesion-inducing cytokines to leukocytes. Immunol. Today 14, 111-115, 1993. 104. Tanaka, Y., Adams, D. H., Hubscher, S., Hirano, H., Siebenlist, U., Shaw, S. T-cell adhesion induced by proteoglycan-immobilized cytokine MIP-1 beta. Nature 361, 79-82, 1993. 105. Wahl, S. M., Wen, J., and Moutsopoulos, N. TGF-beta: a mobile purveyor of immune privilege. Immunol Rev 213, 213-227, 2006. 106. Munger, J. S., Huang, X., Kawakatsu, H., Griffiths, M. J., Dalton, S. L., Wu, J., Pittet, J. F., Kaminski, N., Garat, C., Matthay, M. A., Rifkin, D. B., Sheppard, D. The integrin alpha v beta 6 binds and activates latent TGF beta 1: a mechanism for regulating pulmonary inflammation and fibrosis. Cell 96, 319-328, 1999. 107. Koli, K., Saharinen, J., Hyytiainen, M., Penttinen, C., Keski-Oja, J. Latency, activation, and binding proteins of TGF-beta. Microsc Res Tech 52, 354-362, 2001. 108. Yu, Q., Stamenkovic, I. Cell surface-localized matrix metalloproteinase-9 proteolytically activates TGF-beta and promotes tumor invasion and angiogenesis. Genes Dev 14, 163-176, 2000. 109. Acharya, P. S., Majumdar, S., Jacob, M., Hayden, J., Mrass, P., Weninger, W., Assoian, R. K., Pure, E. Fibroblast migration is mediated by CD44-dependent TGF beta activation. J Cell Sci 121, 1393-1402, 2008. 110. Toole, B. P. Hyaluronan: from extracellular glue to pericellular cue. Nat Rev Cancer 4, 528-539, 2004. 111. Stern, R., Asari, A. A., Sugahara, K. N. Hyaluronan fragments: an information-rich system. Eur J Cell Biol 85, 699-715, 2006. 112. Laurent, T. C., Fraser, J. R. E. Hyaluronan. FASEB J. 6, 2397-2404, 1992. 113. Underhill, C. B., Nguyen, H. A., Shizari, M., Culty, M. CD44 Positive Macrophages Take Up Hyaluronan During Lung Development. Dev Biol 155, 324-336, 1993. 114. Culty, M., Nguyen, H. A., Underhill, C. B. The hyaluronan receptor (CD44) participates in the uptake and degradation of hyaluronan. J Cell Biol 116, 1055-1062, 1992. 115. Jiang, D., Liang, J., Noble, P. W. Hyaluronan in tissue injury and repair. Annu Rev Cell Dev Biol 23, 435-461, 2007. 116. Liang, J., Jiang, D., Griffith, J., Yu, S., Fan, J., Zhao, X., Bucala, R., Noble, P. W. CD44 is a negative regulator of acute pulmonary inflammation and lipopolysaccharide-TLR signaling in mouse macrophages. J Immunol 178, 2469-2475, 2007. 117. Kawana, H., Karaki, H., Higashi, M., Miyazaki, M., Hilberg, F., Kitagawa, M., Harigaya, K. CD44 Suppresses TLR-Mediated Inflammation. J Immunol 180, 4235-4245, 2008. 118. Vachon, E., Martin, R., Plumb, J. D., Kwok, V., Vandivier, R. W., Glogauer, M., Kapus, A., Wang, X., Chow, C. W., Grinstein, S., Downey, G. P. CD44 is a Phagocytic Receptor. Blood 107: 4149-4158, 2006. 119. Vachon, E., Martin, R., Kwok, V., Cherepanov, V., Chow, C. W., Doerschuk, C. M., Plumb, J., Grinstein, S., Downey, G. P. CD44-mediated phagocytosis induces inside-out activation of complement receptor-3 in murine macrophages. Blood 110, 4492-4502, 2007. 120. Hart, S. P., Dougherty, G. J., Haslett, C., Dransfield, I. CD44 regulates phagocytosis of apoptotic neutrophil granulocytes, but not apoptotic lymphocytes, by human macrophages. J Immunol 159, 919-925, 1997. 121. Krammer, P. H., Arnold, R., Lavrik, I. N. Life and death in peripheral T cells. Nat Rev Immunol 7, 532-542, 2007. 122. Chen, D., McKallip, R. J., Zeytun, A., Do, Y., Lombard, C., Robertson, J. L., Mak, T. W., Nagarkatti, P. S., Nagarkatti, M. CD44-deficient mice exhibit enhanced hepatitis after concanavalin A injection: evidence for involvement of CD44 in activation-induced cell death. J Immunol 166, 5889-5897, 2001. McKallip, R. J., Do, Y., Fisher, M. T., Robertson, J. L., Nagarkatti, P. S., Nagarkatti, M. Role of CD44 in activation-induced cell death: CD44-deficient mice exhibit enhanced T cell response to conventional and superantigens. Int Immunol 14, 1015-1026, 2002. 124. Do, Y., Rafi-Janajreh, A. Q., McKallip, R. J., Nagarkatti, P. S., Nagarkatti, M. Combined deficiency in CD44 and Fas leads to exacerbation of lymphoproliferative and autoimmune disease. Int Immunol 15, 1327-1340, 2003. 125. Nakano, K., Saito, K., Mine, S., Matsushita, S., Tanaka, Y. Engagement of CD44 up-regulates Fas ligand expression on T cells leading to activation-induced cell death. Apoptosis 12, 45-54, 2007. 126. DeGrendele, H. C., Kosfiszer, M., Estess, P., Siegelman, M. H. CD44 activation and associated primary adhesion is inducible via T cell receptor stimulation. J. Immunol. 159, 2549-2553, 1997. 127. Ariel, A., Lider, O., Brill, A., Cahalon, L., Savion, N., Varon, D., Hershkoviz, R. Induction of interactions between CD44 and hyaluronic acid by a short exposure of human T cells to diverse pro-inflammatory mediators. Immunology 100, 345-351, 2000. 128. Kryworuchko, M., Gee, K., Diaz-Mitoma, F., Kumar, A. Regulation of CD44-hyaluronan interactions in Burkitt's lymphoma and Epstein-Barr virus-transformed lymphoblastoid B cells by PMA and interleukin-4. Cell Immunol. 194, 54-66, 1999. Levesque, M. C., Haynes, B. F. In vitro culture of human peripheral blood monocytes induces hyaluronan binding and up-regulates monocyte variant CD44 isoform expression. J. Immunol. 156, 1557-1565, 1996. 130. Sague, S. L., Tato, C., Pure, E., Hunter, C. A. The regulation and activation of CD44 by natural killer (NK) cells and its role in the production of IFN-gamma. J Interferon Cytokine Res 24, 301-309 , 2004. 131. Watanabe, Y., Hashizume, M., Kataoka, S., Hamaguchi, E., Morimoto, N., Tsuru, S., Katoh, S., Miyake, K., Matsushima, K., Tominaga, M., Kurashige, T., Fujimoto, S., Kincade, P. W., Tominaga, A. Differentiation stages of eosinophils characterized by hyaluronic acid binding via CD44 and responsiveness to stimuli. DNA Cell Biol 20, 189-202, 2001. 132. Fukui, M., Whittlesey, K., Metcalfe, D. D., Dastych, J. Human mast cells express the hyaluronic-acid-binding isoform of CD44 and adhere to hyaluronic acid. Clin Immunol. 94, 173-178, 2000. 133. Dasgupta, A., Takahashi, K., Cutler, M., Tanabe, K. K. O-linked glycosylation modifies CD44 adhesion to hyaluronate in colon carcinoma cells. Biochem. Biophys. Res. Comm. 227, 110-117, 1996. 134. Xu, H., Manivannan, A., Liversidge, J., Sharp, P. F., Forrester, J. V., Crane, I. J. Involvement of CD44 in leukocyte trafficking at the blood-retinal barrier. J Leukoc Biol 72, 1133-1141, 2002. 135. McKallip, R. J., Fisher, M., Gunthert, U., Szakal, A. K., Nagarkatti, P. S., Nagarkatti, M. Role of CD44 and its v7 isoform in staphylococcal enterotoxin B-induced toxic shock: CD44 deficiency on hepatic mononuclear cells leads to reduced activation-induced apoptosis that results in increased liver damage. Infect Immun 73, 50-61, 2005.